Former Spurs point guard Tony Parker played 17 seasons with San Antonio before signing with Charlotte last July. SAN ANTONIO — Eleven days after they booed Kawhi Leonard out of the AT&T Center, Spurs fans are expected to give former Spurs point guard Tony Parker a markedly different reception Monday night when he plays against the Silver and Black for the first time since he signed with Charlotte last July. Parker won four NBA championships in 17 seasons with the Silver and Black before he reached a two-year, $10 million deal with the Hornets as an unrestricted free agent. Long described as the Spurs’ offensive engine by coach Gregg Popovich, Parker was MVP of the 2007 Finals and a six-time All-Star with San Antonio. Even after he signed with Charlotte, Parker said he always would be a Spur and love San Antonio. Since Parker was no longer a starter, fans generally understood when he opted to leave the Spurs and make a new start in Charlotte. “It will really look weird seeing him in another uniform, won’t it?” Popovich said. “But I’m anxious to see him. We talk frequently. He’s always going to be part of my thoughts. He’s a special young man and I’ve always felt like a second daddy to him over the years and he’s been like a son in all kinds of ways. An All-NBA forward, Leonard was expected to be the cornerstone of the franchise for years to come. But his relationship with the Spurs fell apart last season, when he was limited to nine games by a quadriceps injury. He demanded a trade last June, after months of acrimony with Spurs management over the diagnosis and rehabilitation of his injury. The Spurs traded Leonard and guard Danny Green to Toronto for All-NBA guard DeMar DeRozan and center Jakob Poeltl. When Leonard returned to the AT&T Center for the first time since the trade on Jan. 3, fans jeered and roundly booed the Raptors star whenever he touched the ball. That included the pregame warmups. The crowd also chanted “traitor” and “quitter” every time Leonard stepped to the free-throw line. 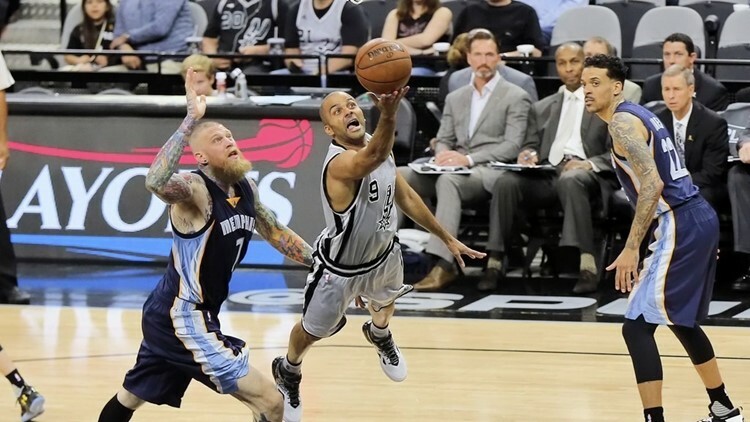 Former Spurs point guard Tony Parker, a six-time All-Star and four-time All-NBA selection, was named MVP of the 2007 Finals, when the Silver and Black swept LeBron James and the Cleveland Cavaliers. The reception for Parker will contrast sharply with the treatment Leonard got. A lock for the Naismith Memorial Basketball Hall of Fame, Parker averaged 31.1 minutes, 15.8 points, 5.7 assists and 2.8 rebounds in his 17 seasons with the Spurs. Asked if it will be difficult to see Parker in a different uniform, Popovich said: “There are a lot tougher things in life. This is basketball. It pulls at the heartstrings a little bit, but the situation is great for him. He’s doing a great job. Murray, who replaced Parker in the starting lineup, sustained a season-ending knee injury in an exhibition game last October. Parker, 36, teamed with Tim Duncan and Manu Ginobili, aka the “Big Three” in Spurs lore, to win four NBA titles and more games than any other trio in league history during their 14 seasons together. With Charlotte playing in the Eastern Conference, Parker’s appearance at the AT&T Center on Monday will be his only opportunity of the regular season to play on his former home court. The Silver and Black complete their two-game series with the Hornets on March 26 in Charlotte. 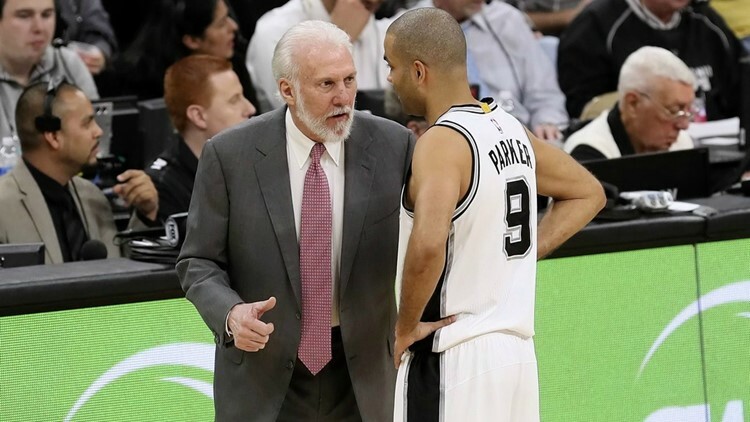 Tony Parker and Spurs coach Gregg Popovich developed a father-son relationship during Parker's 17 seasons in San Antonio, where he became part of the franchise's famed Big Three with Tim Duncan and Manu Ginobili. Parker has averaged 9.4 points, 3.8 assists and 19 minutes in 37 games off the bench with the Hornets (19-23). Charlotte is in its first season under coach James Borrego, who was an assistant to Popovich for three years before being hired by the Hornets last May. Only 19 when he started his NBA career with the Spurs in 2001, Parker became the team’s starting point guard five games into his rookie season and held the job until being replaced by Murray last January. Parker’s career took a downturn in May 2017, when he sustained a career-threatening quadriceps injury during the Spurs’ series against the Houston Rockets in the Western Conference semifinals. He had surgery two days later and wasn’t expected to return to the lineup until January, at the earliest, but he made his 2017-18 season debut on Nov. 27. Parker remained in the starting lineup for 21 of the next 28 games he played in. Murray supplanted Parker as the Spurs’ point guard on Jan. 21, 2018, marking the end of an era for the team. Parker had come off the bench only 13 times in 1,164 regular-season games before Popovich made the change. It couldn’t have been easy for Parker to go to the bench but, from all accounts, he handled Popovich’s decision with his characteristic class and aplomb. That came as no surprise to anyone who had followed Parker’s stellar career through the years. A consummate team player, Parker played a key role in helping cultivate the culture that has made the Spurs a model franchise in pro sports for more than 20 years. “Tony understands what’s best for a basketball team,” Popovich said then. “He’s a character guy. He knows that at this stage of his career being a mentor is really important, and he’s still going to be an important part of what we do. But Dejounte is a young talent, and we need to find out exactly what we have there, so it’s time. 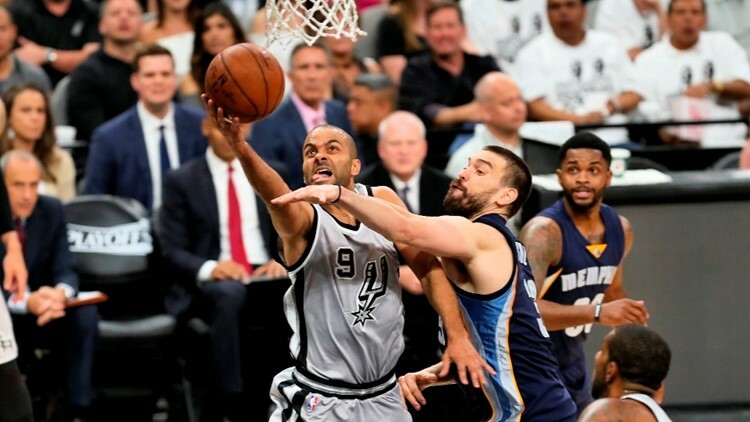 Spurs point guard Tony Parker, going up for a shot as Memphis Grizzlies center Marc Gasol defends, was a team leader on and off the floor during his 17 seasons in San Antonio. Popovich expressed the same sentiments about Parker last week when he was asked about how seamless Parker made the passing of the torch to Murray. Born in Belgium, Parker already had played pro basketball for two seasons in France when the Spurs selected him with the 28th overall pick of the 2001 NBA draft. Parker faced a steep learning curve as a rookie despite his pro experience in Europe. Popovich rode Parker hard in those early days, but Parker never broke. He adapted to Pop’s coaching and steadily developed into one of the league’s best point guards. 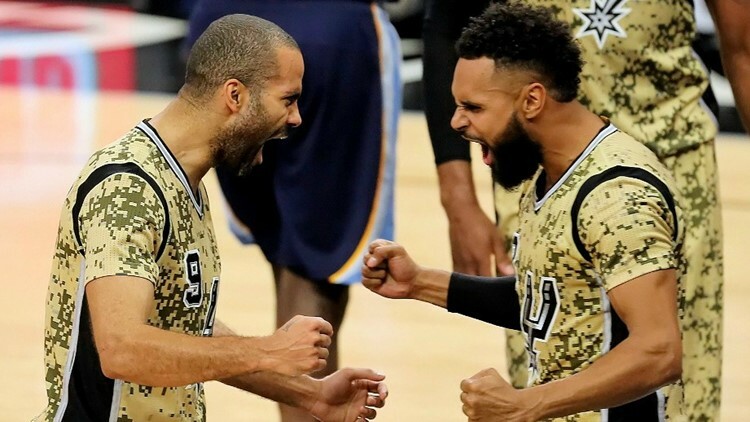 Tony Parker, celebrating a big Spurs play with guard Patty Mills, played with the Spurs for 17 seasons before signing with Charlotte last July. When Parker signed with Charlotte, Popovich released a statement expressing his thoughts on Parker’s contributions to the Spurs’ success. “It’s difficult to put into words how important Tony Parker has been to the Spurs franchise over the past two decades,” Popovich said in the statement. "From his first game in 2001 at age 19, TP has impressed and inspired us – day-after-day, game-after-game, season-after-season – with his passion, dedication and desire. We are grateful to Tony for 17 years of truly amazing memories. Popovich was asked last week how much of Parker’s corporate knowledge the Spurs have missed this season. “All of it,” he said. “That’s why we basically started from scratch this year. LaMarcus [Aldridge] and Patty [Mills] have been here a couple years, but they’ve had a lot of work to do just like the coaches indoctrinating everybody else.